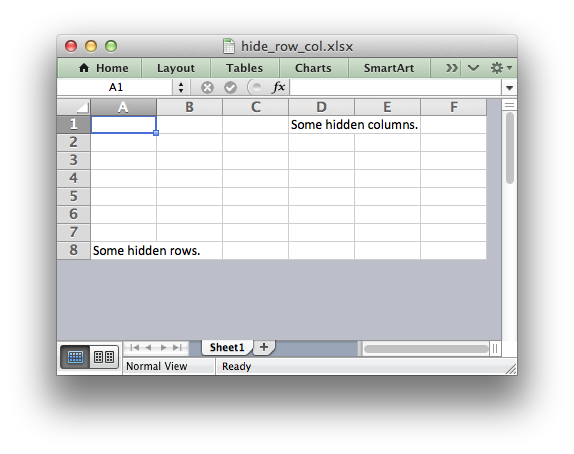 This program is an example of how to hide rows and columns in XlsxWriter. However, in order to hide a large number of rows, for example all the rows after row 8, we need to use an Excel optimization to hide rows without setting each one, (of approximately 1 million rows). To do this we use the set_default_row() method. Columns don’t require this optimization and can be hidden using set_column(). # Excel uses an optimizations to hide all rows that don't have data. # Hide all rows without data. # Columns can be hidden explicitly. This doesn't increase the file size..